Just about any serious bartender can espouse upon the differences on the palate between malt whisky, rye whiskey and Bourbon whiskey. Each type has its own nature – before any time spent in wood. Aging in wood can add woody flavor, but it cannot change the flavor from rye to maize or barley. Likewise, a very old Scotch blended whisky will not take up the flavor of a pure malt whisky, no matter how long it sits in the barrel. Malt whisky is pot-distilled from 100% barley. Scotch blended whisky is a small amount of malt whisky used to flavor a much greater amount of highly-distilled maize spirit. If both malt and blended whiskies from Scotland were available in their younger, colorless states, whisky lovers would be sure to correct anyone who made the mistake of saying that the two types of whisky from Scotland were white and brown. Then we come to rum. Unfortunately, most laypersons (and many in the liquor industry) persist in classifying rum in three types: light (or white – either way in the sense of lack of color), gold and dark. It’s clear that the problem lies with the disparate meanings of ‘light’ – luminous or un-heavy. Given rum’s current caché, this understandable but culinarily-criminal error cries out to be corrected. It’s time we got real about rum. In the beginning, all rum (including that from the Spanish-speaking and French-speaking Caribbean) was made by fermenting molasses (a by-product of refining sugar from sugar cane) for two or three days and then distilling a spirit from it using a low-efficiency pot still. Any rum that is still made using these techniques should be called traditional rum. Traditional rum has the full flavor that all rum once had. That is because the longer fermentable material is fermented and the lower proof it is distilled at, the more flavor the resulting spirit will have. I include blended rums where the majority of the blend is made up of pure pot-still rum as traditional rum. I did not coin the phrase, ‘traditional rum.’ A few distillers still use it. Savanna distillery on the French island of Réunion is the only distillery in the world that I know of that produces traditional rum and light rum and agricole rum. They refer to their pot-distilled molasses rum as, “rhum traditionnel.” Though most Spanish-speaking rums are light, the people at Diplomatico in Venezuela tell me that all of their rums are molasses rums and that their Reserva Exclusiva bottling is about 80% pot-distilled. I would consider that on the traditional side of rum. Their soon-to-be-released Ambassador is 100% pot-distilled. If I had to drink only one type of rum, it would be traditional rum. Originally, the phrase “light rum” referred to rum that was made using fermentation and distillation methods that resulted in a rum that was lighter in flavor than traditional rum. For light rum, the molasses is fermented for only about one day and then the spirit is distilled from it at high efficiency in a continuous still. This method was developed in the late nineteenth century in Cuba. In the Cuban rum episode of the Thirsty Traveler, Havana Club master distiller Juan Carlos Gonzalez tells Kevin Brauch, “All Cuban rums are light.” Havana Club offers a 15 year old bottling, which is quite brown, but it is light rum because it was fermented and distilled in a way that produces a rum that is lighter in flavor, even after long aging. Old light rums will invariably taste much more of the wood (or added vanilla in some products from Trinidad) than the molasses. The majority of rums available on the market are light rums – including the brown ones. Because it can be operated non-stop and produces more salable bottles from the same amount of raw material, the continuous still has replaced the pot-still in most rum-producing countries – even English-speaking ones. Most rums from Trinidad and the Virgin Islands are light rums, even though English is spoken there. 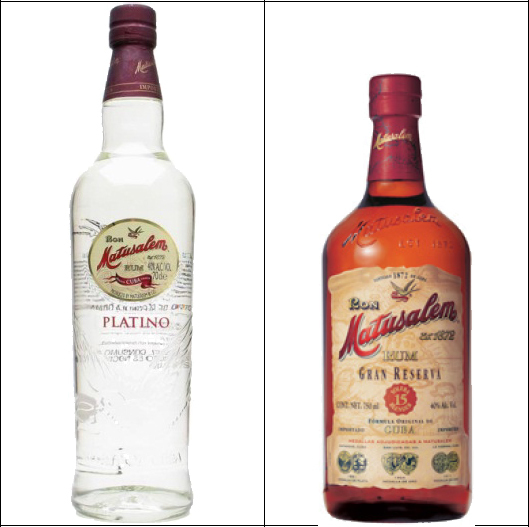 Almost all Spanish-speaking rums are light. There are exceptions, however. Just as Scotch blended whisky is mostly highly-distilled maize spirit (a.k.a. grain whisky) with a little malt whisky in it for flavor, blended rum is mostly light rum with a little traditional rum in it. Most rums from Barbados and Bermuda are blended rums. Jamaican law requires that no rum be sold as Jamaican rum without pot-distilled rum in it. This means that to create a cheaper product that is also lighter in flavor, Jamaican distillers sell a large amount of blended rum. A good example of this is the J. Wray & Nephew distillery. 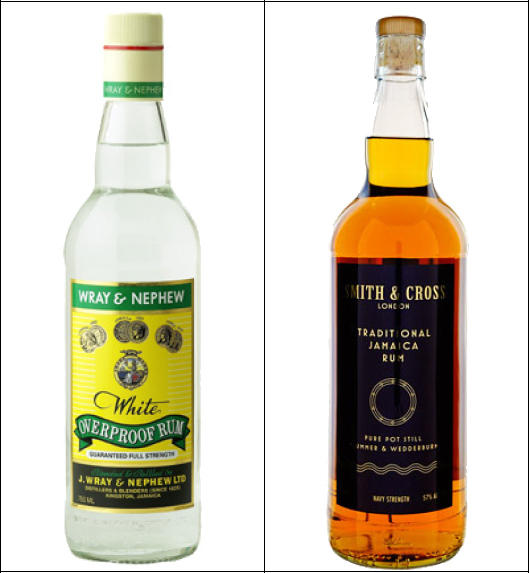 While their White Overproof rum is traditional rum (and the one rum bottle you are most likely to find in any Jamaican household), their export-focused Appleton line is blended rum. I tend to shy away from blended rums, preferring to blend them myself if I so choose. But, there are several very good blended rums that feature wood and unique aging as an important part of their flavor. Dos Maderas and Santa Teresa are such products. So-called ‘heavy’ rums like Myers’s are usually light or blended rums that have been compounded with actual molasses. Over time, events like the Haitian slave rebellion and wars with Britain and their more powerful navy caused France to seek a domestic source for sugar. Perfectly acceptable sucrose (sugar) can be refined from other sources, such as the sugar beet. Once France began producing domestic sugar, plantations in the French-speaking Caribbean had less cause to refine sugar from their cane. There is some evidence that spirits had been distilled in the French Caribbean from cane nectar before, but the above events ensured that it would become the norm. Thus was born agricole rum. Agricole rum must be lowly distilled in pot stills and therefore has plenty of flavor – just not that of molasses. Other cane nectar rums exist that do not quite fit the French legal requirements for agricole rum. Barbancourt from Haiti is one example. In many ways, agricole rum is more akin to Brazilian cachaça than it is to traditional rum, light rum or blended rum. The island of Réunion in the Indian Ocean is legally a part of metropolitan France, and the refining of sugar from sugar cane continues there to this day. That is why Réunion’s Savanna distillery produces fine examples of both traditional rum and agricole rum, both types available either colorless or aged and brown. Having both pot and continuous stills, Savanna also produces light rum. Most agricole rum available in the U.S.A. comes from Martinique and is very good, but agricole rum from Guadeloupe is said by some to be just as good, or even better. Back when all rum was still traditional, German-speaking bakers and confectioners found that they loved getting rum’s traditional flavor into their products. The problem was that by the time a barrel of rum was shipped to a European port, and then all the way inland to Vienna, for example, it was just too expensive to use. So, the rum would be cut with a relatively neutral grain spirit and then spiced and aged in used rum barrels to spread the traditional flavor of rum to the cut spirit. 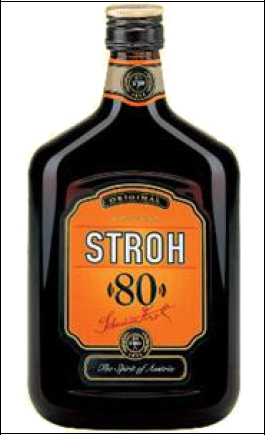 Austrians call the resulting spirit inlander rum – which means the same thing in German and English. Germans call it rum-verschnitt – which means ‘cut rum.’ If I had only read about this process, the purist in me would probably lead me to decline the use of inlander rum. But it is an effective product. I can only guess that it was a learning process and that it is as good as it is out of the past couple of centuries experience. Even though inlander rum is cut and flavored, technically, the end result is to enhance and heighten rum’s traditional flavor – instead of simply compounding or changing it. Rather than drink it neat or base a drink on it, I tend to use inlander rum as an accent in mixed drinks. The one drink that I love based solely on inlander rum is the Hot Buttered Inlander Rum. Other rum-like spirits can be found that deserve brief mention. Batavia arrack is a spirit of cane nectar that is fermented with a little rice. It must be said that arrack is just the Arabic word for ‘spirit’ in the alcoholic sense and is not restricted to any specific type of spirit. Thai arrack is a spirit of molasses that is fermented with a little rice. Mekhong is a common brand of Thai arrack. As noted above, agricole rum’s closest relative is cachaça. Cachaça is also lowly distilled from cane nectar, but not necessarily in copper pot stills the way agricole rum must be. Cachaça is also rarely aged for as long as agricole rum often is, but there are exceptions. Ceylon arrack, charayam (India arrack) and lambanog (Philippine arrack) are not distilled from cane or molasses at all. They are distilled from the nectar of the coconut palm blossom and can’t be considered close relatives of rum. But, by early accounts it is clear that punch was based on India arrack before it was ever made of rum. 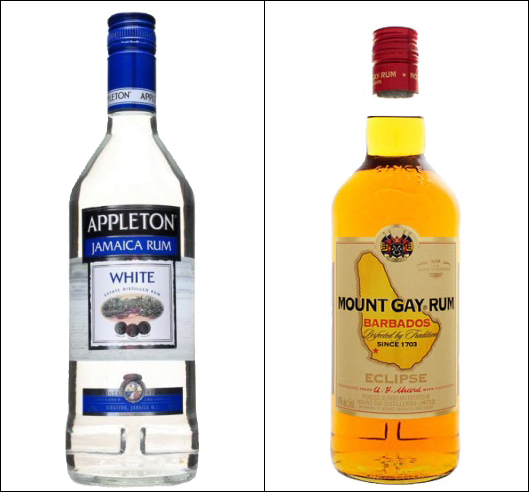 To instruct the palate on the different types of rum, I suggest the following taste testing. 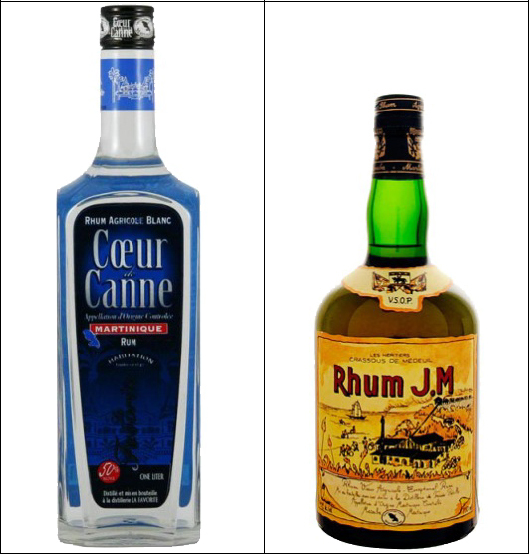 Obtain some Wray & Nephew White Overproof (traditional) rum, Matusalem Platino (light) rum and La Favorite Couer de Canne Rhum Agricole Blanc. Notice that all three products are colorless. Start with the light rum, of course, to prevent the aftertaste of a more flavorful rum confuting a less flavorful one. Smell the Matusalem Platino. Sip it. This is the un-wooded nature of light rum. Smell the Wray & Nephew White Overproof. Don’t sip it yet. Just notice the molasses on the nose that was absent in the light rum. Smell the La Favorite Rhum Agricole Blanc. Don’t sip it yet. Notice that it has a full, pot-still aroma also – but of sugarcane rather than molasses. Now sip the Wray & Nephew. Just a little will do – it is overproof and rather strong in ethanol. Be sure to notice the flavor as distinct from the sensation of the alcohol, which actually has no flavor. Now sip the La Favorite – beware, it is proof (100° or 50%). Finally, consider what a culinary crime it would be to call all of these rums light, just because they have no color. But, back to what Boothby said: a true cocktail is a great way to appreciate any spirit without fouling it up too much. In a true cocktail (or any other type of true sling besides the bittered sling) the sweetness should only be enough to ‘round’ the flavor of the spirit. The dilution should only be enough to open the flavor of the spirit. Finally the bitters are there, not least to reduce the sensation of the alcohol on the palate. This all combines to let the drinker enjoy the essential nature of the spirit without being distracted by its harsher edges – and without occluding it with sour juices or fancy sodas, or by muddling it with the exotic fruit or herb of the hour. If I must use both a jigger of good spirit and a jigger of not-so-good spirit, I might make a cocktail with the good and a sour (or any other type of punch) with the not-so-good. Why do I digress thus? It is because I love rum (without being part of the fad), but don’t always drink my spirits thoroughbred. I wanted a mixed drink that would remain faithful to what good rums can be. That is why I created for myself the World of Rum Cocktail. I believe it presents the various types of rum, harmoniously-mixed, but with each type discernible to the searching palate. 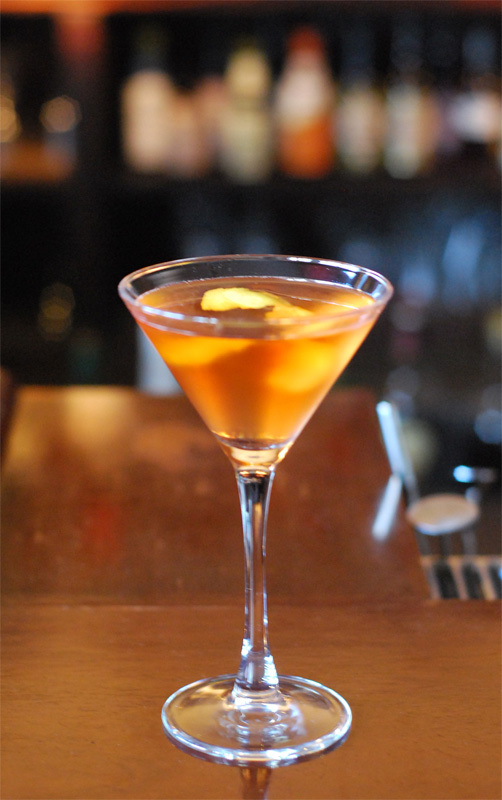 It is accented with inlander rum for its genius in heightening rum. It is bittered with the quintessential Caribbean bitters to sooth out the rough edges of ethanol, which was important for this drink as it contains three spirits at-or-over proof! It is diluted with the fluid-ounce, or so, of water that will be added while stirring the drink through ice. I made this drink for my students at the end of class yesterday evening. It should have gone into the traditional glass cocktail goblet instead of the modern one I put it into last night (the modern, conical cocktail goblet should ideally be reserved for those true cocktails that are sweetened by aromatized wines, such as vermouth, for the advantageous release of the extra aroma – even though the huge surface area allows the drink to warm too quickly). After taking the photo (above left), the drink was consumed in short order to unanimous approval and did not suffer the warming it might otherwise have endured. If the over-use of the cocktail goblet has made it not hip enough for you, you may put this drink into a coupe, but its shallowness will let the drink warm at least as quickly as would the modern cocktail goblet… The drink really should be served in the traditional cocktail goblet shown in the recipe given below (click the image to enlarge it for easier reading). Please do enjoy! Next > Long Dashspoon Sourced!